Anyone who invests is well aware of average returns that are published over the years for various types of indices. These include, but are in no way limited to, the S&P 500, Wilshire 5000, NASDAQ, Emerging Markets, Bonds (short-term and long-term, corporates and government), and various industry sectors (e.g. energy, healthcare, real estate). Often times when we look at the performance of our own portfolios we somehow don’t seem to do as well as the averages. There are many reasons for this. The averages don’t factor in trading costs or our individual decisions to be in an asset class for part of the time and out of it at other times. In addition, true investor returns should ultimately factor in what remains after taxes and inflation, which indices ignore as well. How Would The Average Investor Perform? I’ve been curious as to how the true “average” investor performs over long periods of time. 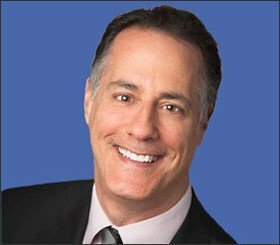 In other words, what really happens when they’re faced with inevitable bouts of fear and greed and stay out of the market when they should be invested most aggressively and get sucked in when the euphoria becomes too great to resist, just when they should be tying themselves to the mast like Odysseus did to resist the sirens. Richard Bernstein is one of the more thoughtful market strategists on Wall Street. He had a long and successful career at Merrill Lynch and now runs his own research firm. 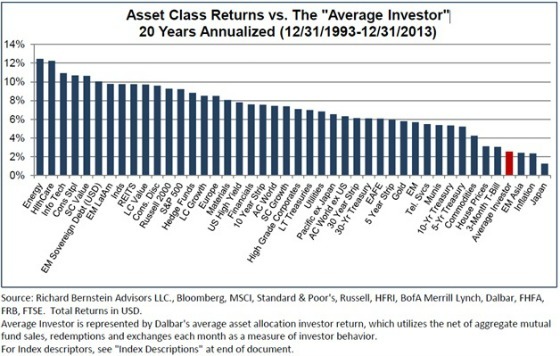 He published this chart showing how the average investor has done compared to various benchmarks over a 20-year period. The results are quite alarming. Out of all of the various investment categories listed in the chart below, the “average” investor only beat three of them: Emerging markets Asia, Inflation, and Japan. The average annual return for the “average” investor was 2.1% during this time period! It’s interesting to see that energy has been the top performer over the last 20 years. This included a period when oil dropped dramatically in 1998 and 2008-9. We are going through a similar period now as oil prices have dropped by approximately 40%. Perhaps energy investments will be able to recover from this drop like they did previously and continue to provide attractive long-term returns. Health care is not surprising that it has done well in the number two spot given the aging of the population and significantly increased spending in this area over the last 20 years. From a CWS perspective, our returns stack up well in that for the nearly 60 apartment investments that we have bought and sold over the last 20+ years the average return has been in the 13%+ range for our investors net of fees. 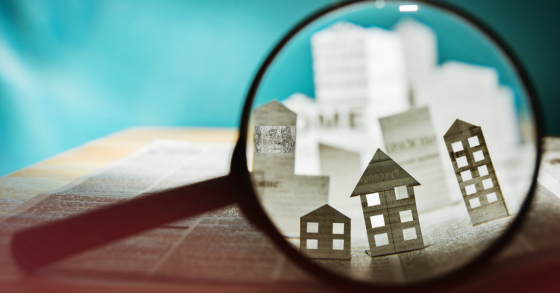 In addition, many of our investors have participated in tax-deferred 1031 exchanges after a property has sold, resulting in the continued investment of pre-tax dollars. The typical stock market investor has to pay capital gains taxes when he or she sells a stock that has gone up in value, leaving one with less after-tax dollars as compared to a real estate investor that carries out a 1031 exchange. The chart above suggests it is wise for the “average” investor to have a consistent investment plan to have savings channeled into various asset classes over time and to ignore the volatility of the markets and stay the course. Timing the market is very difficult and avoid chasing the hot companies, asset classes, and mutual fund managers and focus on being in the game on a diversified basis over long periods of time. This blog has shown how the “average” investor has dramatically underperformed virtually every investment category from 1993-2013. Most investors do not have a disciplined strategy of channeling their savings into various investment categories independent of the headlines. Do you think that they are swayed by bouts of fear and greed which dramatically reduces their long-term results? ‹ A Whiff of Deflation? Are Treasury Yields Any Indication?